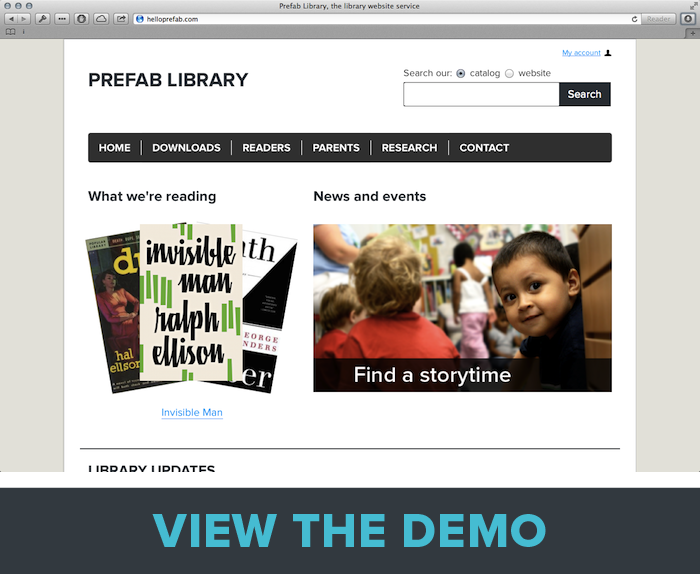 Prefab is a ready-to-launch website designed for libraries. Based on years of library user research, our template gives you everything you need to create a fantastic library website. With Prefab, you won’t even need to worry about hosting. We’ve designed an amazing library website so you don’t have to. It’s easy to get started with Prefab. Email us and we’ll give you a site to play with. Free for 30 days. We’ve done the designing; all you have to do is fill in some amazing content. Writing well is one of the most important things you can do to make your website great. When you’re ready to go live, we’ll sort out payment details and point your domain to our servers. Then you can make a cup of coffee with all of your spare time. ▸ Do we have to use the menu items from the demo site? No way! All of the content is up to you. You can create menu items as you see fit, and as many pages as you like. If you have some questions about the content on your site, let us know and we can chat about it! ▸ Can we still use our library's URL? Yes. You can use the same domain name. We’ll work with you to sort out the details. ▸ Do I need to know HTML to use Prefab? No, you don’t. You can setup your entire site without writing a single piece of HTML. If you can send an email, you can use Prefab. ▸ So all Prefab sites look similar? Prefab sites share the same structure, yes, but colors, logos and graphics can distinguish sites. In reality, there’s no disadvantage if your site shares similar design elements with other libraries. If you’d like to differentiate your site you can always insert custom CSS, or have us do it. ▸ What support do you offer? Good support! First, we’ll give you a tour of your site’s back end. After you live with it for a while you can email us or schedule a call to ask some followup questions. And anytime you get stuck on something, just let us know. ▸ Can I customize the color or layout of my Prefab site? Yes, indeed! You can use CSS to customize your site. Don’t know CSS? We can do it for you.